Two clear and five light grey styrene parts, six resin parts, and decals for a single aircraft. Available online from OzMods for Aus$17.60 (Click for image), or contact these stockists: Hannants & Red Roo Models. Simple and well-executed design, with some useful features included with the decal sheet. This looks to be a simple enough conversion that should present few, if any difficulties. The clear fuselage halves simplify cockpit glazing, and decals for the black wing leading edges, prop tip warning stripes, and wing walks etc are a nice touch. A good quality package overall – Recommended. Grumman proposed a Carrier On Board (COD) version of their E-2A Hawkeye to the US Navy (USN) in 1961. The design used a wider and more voluminous fuselage than the slender one of the Hawkeye. It retained its wings unchanged whilst the tail unit was essentially the same other than it had no dihedral. The USN ordered two E-2A’s to be converted to C-2A Greyhounds, as the COD was to be known, plus a further twenty-nine C-2A’s produced in two batches. The USN then cancelled the last twelve, which caused production to stop in 1967. Fifteen years later and twenty-five years after the prototype first flew, the USN ordered thirty-nine more C-2A’s. These machines were modernised and improved in many ways, and had up-rated engines as well. It was 1988 when production of the C-2A Greyhound ended. 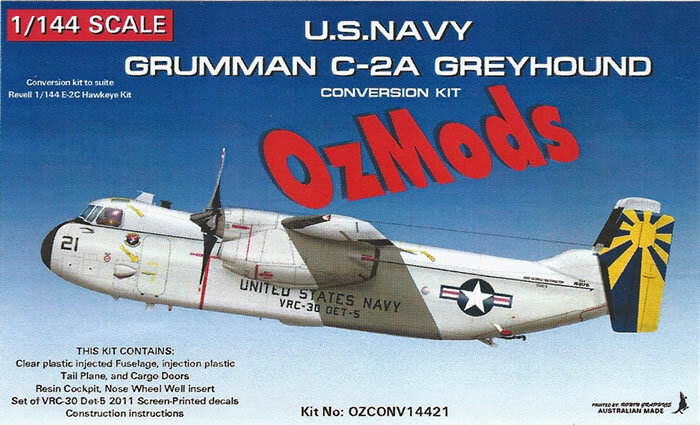 The conversion is for use with the Revell E-2C Hawkeye kit. It comes in a very small top-opening box with a C-2A profile on the front. 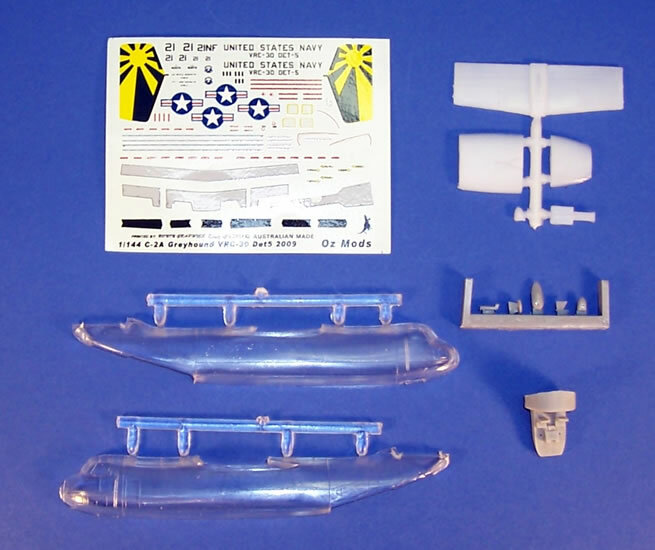 The contents are in three zip-lock plastic bags; they include decals, clear styrene fuselage halves, white styrene tailplane and fins, and a cockpit plus small detail parts in resin. There is also an A-4 page of instructions and an A-5-sized OzMods pricelist. 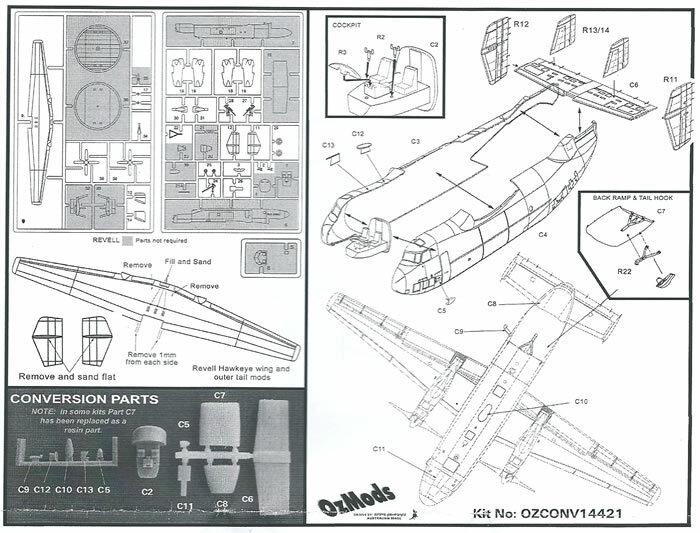 The instructions include a copy of the Revell parts map showing what is not required from their E-2C kit, as well as one that covers the OzMods parts. The instructions outline some simple modifications that need to be made to the Revell wings and the two end-fins. These involve some filling, sanding, and the removal of a couple of small areas. Three exploded diagrams and a plan view of the aircraft’s underside are used to guide assembly. I would describe them as being quite adequate for their purpose. The paint and markings guide is a complete A-4 page of four-view drawings in colour. They give mostly generic paint names, but include an FS-numbers where colour matches are critical. Some small colour images of the real aircraft are included as well. Cockpit detail is quite reasonable for the scale; consisting of a one piece for the floor, bulkhead and seats, with separate control panel and columns, all in resin. It seems unlikely that much of this will be visible however. The nose wheel well is cast under the cockpit floor. 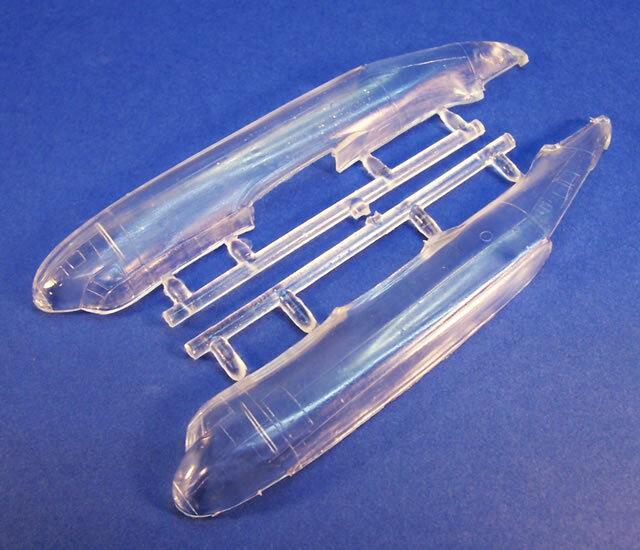 The fuselage halves come moulded in crisp clear styrene, which is a simple and effective way of dealing with the cockpit windows. Fine recessed lines are used to provide a sensibly restrained degree of panel detail, given the small scale. The horizontal stabiliser, cargo doors nose wheel doors, and a scoop are moulded in what seems a quite hard plastic with slightly thick sprue gates. A fine toothed saw may be the best tool for their removal from the sprue. The trailing edge of the stabiliser is quite nice and thin and features fine recessed surface detail. 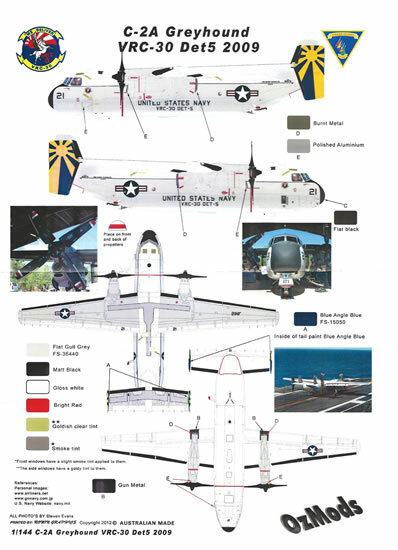 The four vertical fins and rudders are sourced from the Revell E-2C kit, as of course are the wings and engines. The cargo doors can be modelled open or closed, although there is no detail provided for the cargo compartment. The instructions mention that in some kits that the injected plastic cargo door has been replaced by a resin part. Perhaps this is due to mould damage, although my review sample had the plastic one. There are resin blade antennae, bulges, and other small details to fit to the fuselage. All that is left to finish assembly are the Revell kit’s undercarriage and props. 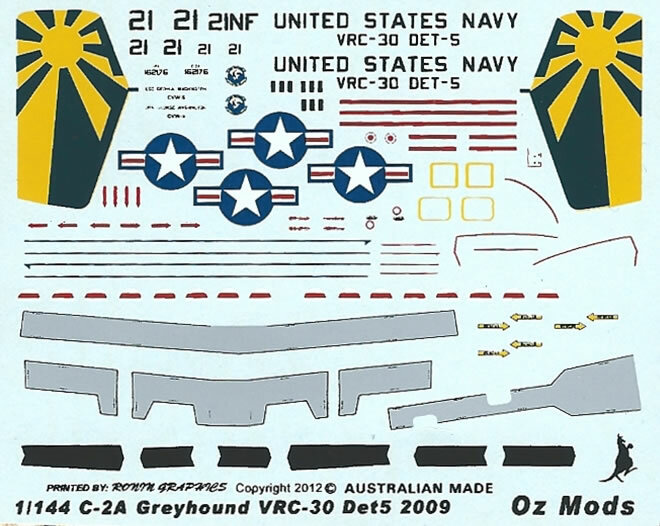 Be aware that OzMods offer eight-blade props for 1/144-scale Greyhounds and Hawkeyes too; these sell as a separate item for Aus$7.70. I am not familiar with the Revell E-2C; but if its quality is at least equal to OzMods, I should think this would be a trouble-free conversion. OzMods provide markings for one aircraft of VRC-30 Det 5 from 2009. The paint and markings guide is well produced and thorough. The decals appear to be of good quality with a very glossy finish. They provide a lot more than the just the basic markings, and include wing walks, warning lines, the black leading edge areas and even propeller tip markings. 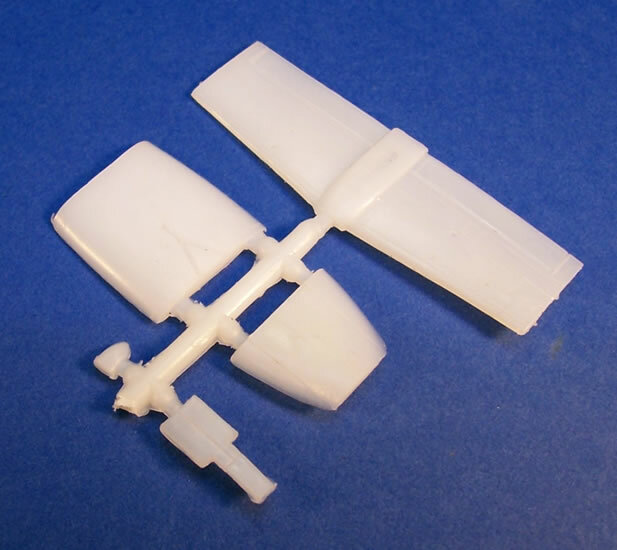 This well-produced set should make for a straightforward conversion of the Revell E-2C kit. I am not familiar with the donor kit, but I would assume that OzMods' delicate surface detail is in keeping with that of Revell’s E-2C. A most comprehensive sheet of decals rounds out the package nicely. These include some thoughtful touches for this small scale, including black wing leading edges, prop tip markings, and wing walks. I am happy to recommend this conversion. Thanks to OZMods for the review sample.